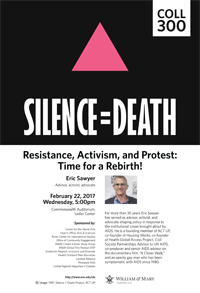 A founding member of ACT UP (1983), co-founder of both Housing Works (1990) and the Health Global Access Project (1999), and Civil Society Partnerships Advisor to UN AIDS (since 2009). An openly gay man who has been symptomatic with AIDS since 1980. At an institution dedicated to inquiry and examination, the intellectual waters are always in a state of unrest. Unrest, in a scientific sense, can imply loss of equilibrium. Unrest can be one feature of a psychological state leading to questioning or creativity; of a social state leading to criticism or conflict. Unrest can be a stimulus or a crisis, a challenge or a moment.